Home » Bad rinks, lumps, bumps and dips on bowling greens. 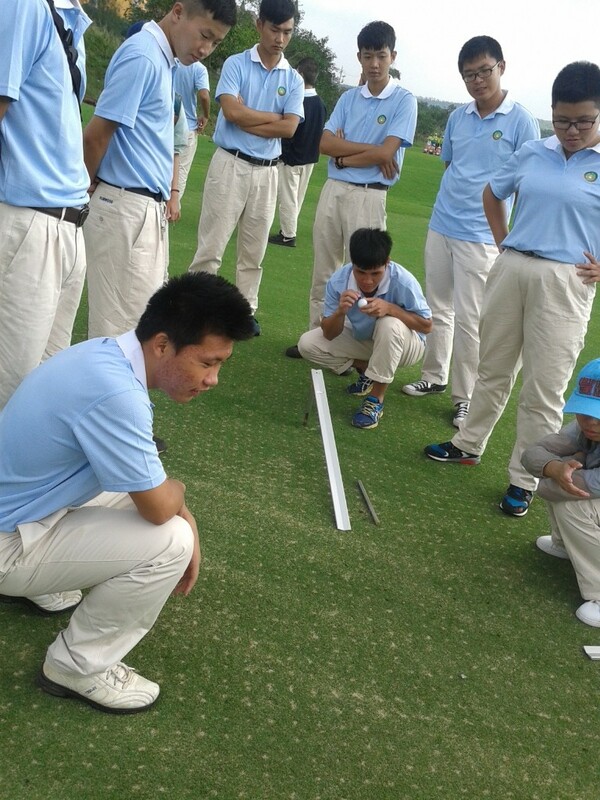 Some of my students trying out the tyre lever (Stimp) and the golf ball. It might seem logical that when the green doesn’t behave the way we expect in terms of the run of the wood on the turf that the levels aren’t right. When we experience bad rinks, we might project onward from this that the deviation from perfection has been caused by some high or low area on the surface, usually the latter. Seeing this apparent correlation between the two factors i.e. the bad shot and the low area, it might seem conclusive that the course of action needed is to top-dress the low spot to bring it up to the right level. This is a classic example of assuming correlation between factors, a clear cause with a clear effect, with a seemingly clear answer into the bargain, but how many times have you personally experienced this process only to find later that the problems return? Into the bargain, we already know that the answer we’ve arrived at in this example is actually potentially damaging to a lot of greens. There is no doubt about the effect, but I think the cause in this example is merely a symptom of the actual root cause. In the Tyre Lever and the Golf Ball, making green performance objective, I put forward a different hypothesis and like any scientific hypothesis the aim is to test it to see if it holds up. As a greenkeeper of some 34 years now, from experience I know there is a definite correlation between the smoothness and trueness of the green surface and the relative firmness of that surface. Furthermore, I know that this is likely to have correlation with the amount of moisture in the green surface and that the moisture content is likely to have correlation with the amount of organic matter (such as thatch) in the soil. So in the Tyre Lever and the Golf Ball, I will put forward this hypothesis and see if there is a way to test it conclusively. But is there a way to prove this objectively and in so doing, develop replicable tests that minimise the chance for human error and that are therefore useful to us on a year to year basis for appraising the relative condition and performance levels of our greens? I think there is and I will explain this in detail in the tyre lever and the golf ball approach to bowling green performance, when my new ebook is released on 28th November 2015. In doing so I hope that I can help clubs to avoid making the wrong cause and effect connections and of course the expensive maintenance errors that follow in many cases.